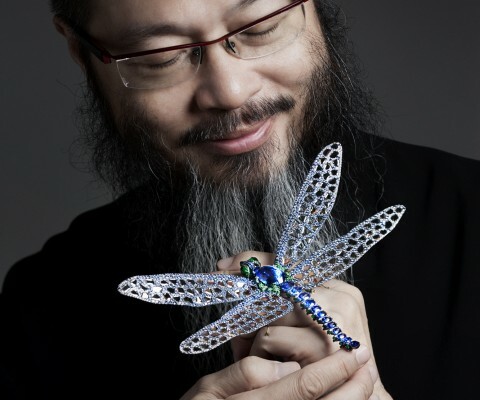 I am honored and overjoyed to feature a fascinating and extremely inspiring interview that I conducted with Master Sculpture & Jeweler, Mr. Wallace Chan. 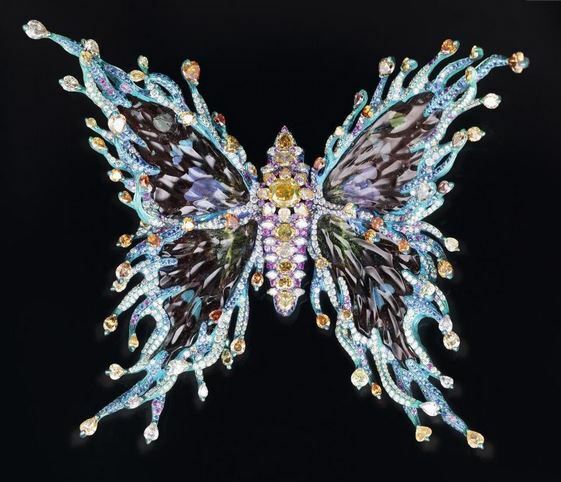 We discuss his exceptional skill in jewelry design, his inspirations from nature and his outlook on life and creativity. To begin I would like to formally welcome Master Sculpture & Jeweler Mr. Wallace Chan to The Black Nouveau, I am so honored to speak with you. TBN: Since your debut as the first Asian designer at the 2012 Biennale des Antiquaires in Paris with the collection “Path to Enlightenment: Art & Zen” your work has been featured in countless publications and has been critically acclaimed as works of sculptural art. Your style is a whimsical blend of naturalistic themes, fantastical motifs and exceptional craftsmanship, where do you draw inspiration from? W.C: To create is to live fully, to absorb knowledge in all ways, and to practice repeatedly. The creating process can be described with two words, “life” and “understanding”. Life is the key to creation, a vital element. Creation changes, and is full of vitality, it reflects the pulse of the heart and the spirit of the age, and motivates the development of history. Creation and life are interactive, for there to be creation, there must be life, and for life to have meanings, creativity is a must. “Understanding” involves communication and channels. The creator must understand the skies, the earth and in between the two, human beings. It may sound a bit vague, but to put it in simple words, it means the creator should learn about the past, the present and the future, and he should dig into different kinds of knowledge e.g. astrology, geography, technology, history, psychology and philosophy etc. As for inspiration, when you understand life and the universe, you will naturally understand that, there is humanity in everything, from a piece of wood to an elephant. When you treat them with emotions, they respond to you in the same way. Inspiration comes from the accumulation of our everyday experience. Like the herbal cabinet of the Chinese doctors, each little piece of our memories is stored in one little drawer, and when I see a gemstone, these pieces of memories come out from different drawers, they entwine, merge and transform with one another, and this interaction generates creativity. I hope to re-interpret and enliven the elements of Mother Nature and culture through jewelry creation, and pass the wisdom of the skies, the earth and human beings on to the next generation. But to make it happen, solid and cultivated craftsmanship is crucial, from techniques to materials and tools, it is important to invent new ways in order to have our imagination actualized. T.B.N: You have been credited as the creator of the “Wallace Cut” may I ask what this means, how did you come about designing it? W.C: Why did I invent “Wallace Cut”? One time I went to a photography exhibition, in one of the photographs I saw the images of a man overlapped. They said it was a dark room technique called “multiple exposures”. I wondered if I could achieve the same effect with carving. I kept this piece of memory and the curiosity on my mind. When I finally started learning about gemstone cutting, I saw how the light entered the gemstone’s body through its surface, and how the light interacts intensively inside it. This experience recalled my impression on “multiple exposure”, and since I had acquired the knowledge to carve and design with gemstones, I could try to realize my idea this time. The Wallace Cut is a carving technique which creates an illusion in transparent materials by combining medieval 360-degree intaglio into 3-dimension engraving. The resulting quintuple reflection unifies these features with precise calculation and angle casting and forms a 3-dimension and multi-line reflection. 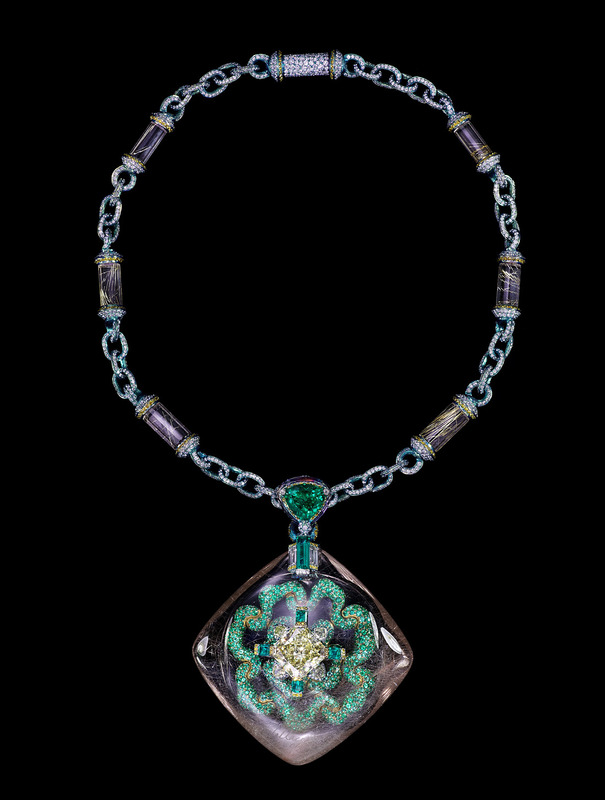 The “Now and Always” necklace featuring a signature 35.4ct Wallace Cut aquamarine with the image of Horae the Greek Goddess of nature, with amethysts, diamonds, blue topaz, sapphires and opals. Moreover, the tools that were available on the market were not sophisticated enough. I had to make some of the tools specifically for this work. I went to a factory and became an apprentice in order to learn about the mechanics it took to invent the tools. After six months in the factory, I found out that I could use the dentist’s tool for it. But the drill rotated for 36,000 times per minute, which was too fast, and the heat it generated while carving would damage the stone. At last I realized that I had to do the carving under water. So here it went: I carved, I dried the stone, checked to see if it was alright, (because one tiny mistake would be reflected into four more mistakes, and the whole piece of work would be ruined,) and then I put it into water to carve again. It was a stroke by stroke process, I forgot how many hours I worked on each piece, but at the end I felt that my mind, my hand, and the tool were all working as one, it was my consciousness doing the carving. It was 1987, and it was one of the craziest carving periods in my life. I surrendered myself to the magic of light and shadow, and found great happiness in it. I had to do a lot of calculations to determine where the center was – where exactly would the face be situated. The next step was the amount of space for each half of the face; both sides have to be symmetrical. Then there were the angles of the faceting on the periphery of the face in order to achieve the number of reflections that I wanted. And even if the calculations were all correct, I still needed to put them through some trials before I committed them to the stone. All in all, this piece took me two years to finish, not counting the years I spent in perfecting the 3-dimensional technique. Life was not easy during those two years, I had to earn a living, and at the same time keep inventing. 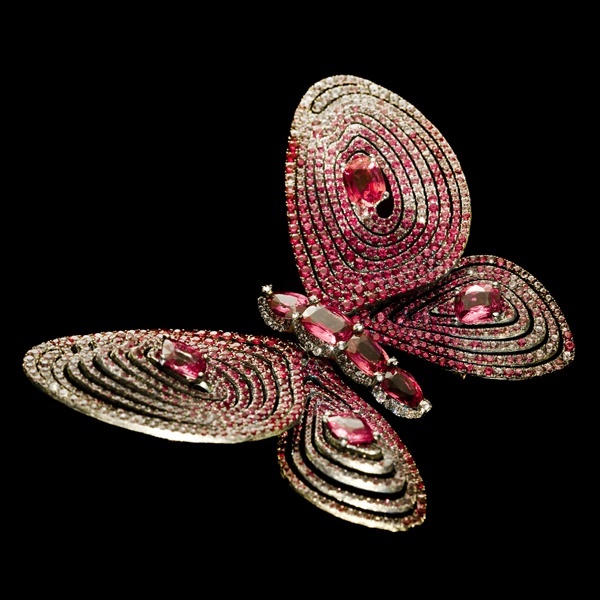 T.B.N: With your vast knowledge of Gemology, metallurgy and sculpture, what sort of obstacles do you encounter when designing a piece? You have been known to completely destroy pieces if they are not up to your standards, would you call yourself a perfectionist when it comes to your art? 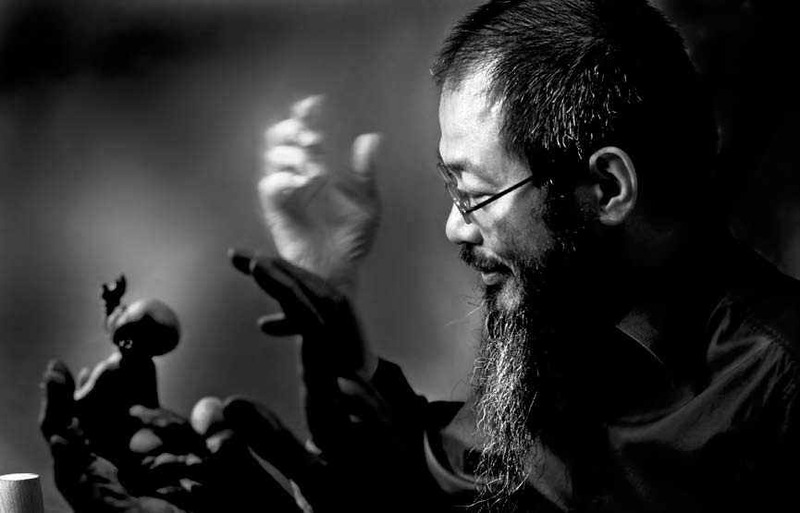 W.C: Since I began my creative journey in 1973, I have gotten used to absorbing knowledge and techniques from all directions. The wisdom left to us by our ancestors benefits us throughout life, but no matter what we do, we must not depend it all on existing knowledge. We have to explore and pave new paths. We have to turn our world upside down. Upon the old foundation, we have to build something new for the development of our future. Difficulty has an intimate relationship with creation. It nurtures creativity and through challenges we grow. Difficulty comes from everywhere, from tools to techniques, materials and our mentality. But as long as we can overcome our own desires, we know how to deal with difficulty without backing down, as well as without fear, anxiety and disgust. The path of creation is often lonely, but this lonesome feeling makes us strong and helps us persist. Creativity grows as a result. I feel that I have entered a fairyland every time I meet obstacles, and once I solve my problems, I go back on earth with a sense of satisfaction and joy that is beyond words. I pursue perfection, but there is no perfection in this world, there is nothing you can call the highest, or the best. But this is the reason why there are limitless possibilities. As there is no limitation, I can pursue perfection without fear, I can try, I can fail, and there is no need to compromise. I am used to absorbing new knowledge with open arms and an open heart. I am always under pressure, and upon the existing pressure I pressure myself even more, to explore the depth and width of knowledge and work my mind out. 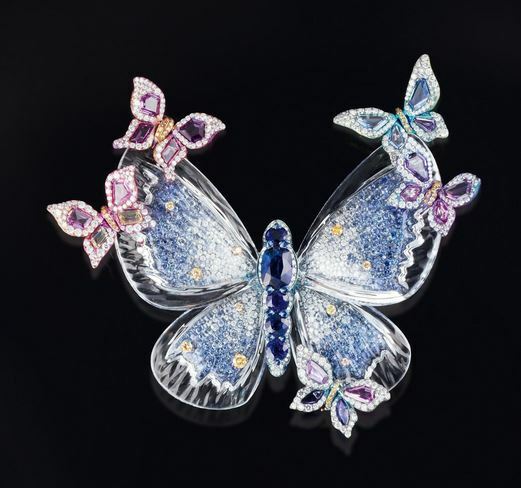 T.B.N: My absolute favorite pieces are your exquisite butterflies. They represent your work very well and are a reoccurring theme in your collections. Do you have a favorite piece that you consider your greatest achievement? W.C: Underneath the sugar-coated idea – “greatest achievement”, you can only find stumbling blocks. I do not have anything that I can call my “greatest achievement”, but I am happy to share with you a creation that I have recently completed. This creation has been on my mind for more than a decade, until about 4 or 5 years ago, I started to have it realized. In the process of creation, I went through tons of struggles and was often close to giving it up, but I couldn’t help continuing. Finally, it was completed right before the 27th Biennale des Antiquaires. 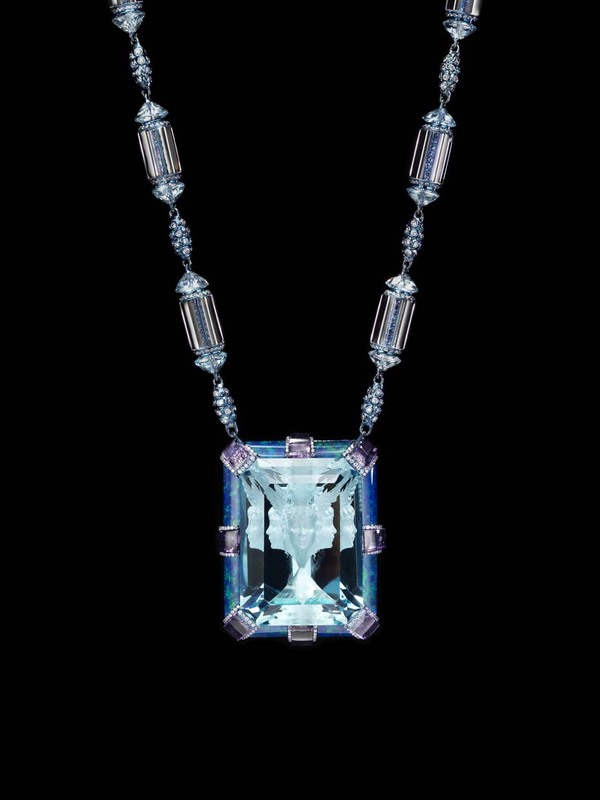 The Wallace Chan “Secret Abyss” necklace has a yellow diamond of 10.05 cts set in a rutilated quartz shell of 211.74ct and complemented with emeralds, fancy colored diamonds, amethysts and rutilated quartz. This creation is titled “Secret Abyss”; it expresses my exploration on the meaning of existence. More than 10 years ago, I saw a magician trying to escape from a glass tank of water whilst chained and handcuffed; logic said that it wasn’t possible, yet he escaped. I was moved by the performance; I was, in fact, extremely impressed. And after some years the idea of “Secret Abyss” came alive on my mind. When you try to make an idea reality, it is often the case that a series of difficulties, sacrifices and failures tag along. 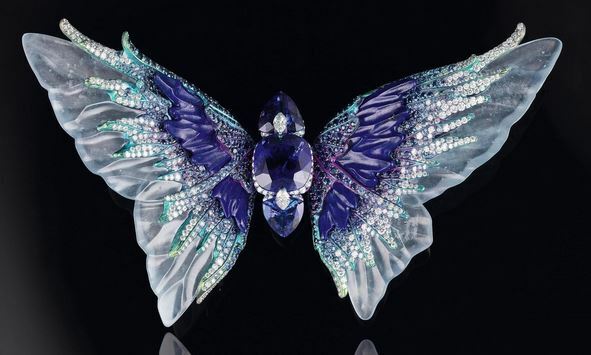 I was looking for the materials for this creation, at first I thought crystal would do, but it was too clear, so it could not create the dream-like feeling I wanted. I gave up the idea of using crystal and turned to rutilated quartz instead. The texture of rutilated quartz gives the feel of a fairyland. But it is not easy to find rutilated quartz that meets the standard required for my creation, so it took a long time and great efforts. After acquiring the suitable materials, I created a 6.5MM opening on the rutilated quartz, through this small opening my tools got in and empty the stone out. Where could I find the right tools to do this? As the creation has never been done before, naturally no one had invented the tools I needed. So it was another long process of consideration, calculation, design and experiment to have the right tools invented. I’d better not go into details here. After a series of failures and tons of broken materials, I finally found a way to empty the stone out in a satisfying state. The 43MM wide space inside the stone became my creative space. My tools entered the space through the 6.5MM opening, and gemstone clouds were set. I would say that the 6.5MM opening was the entrance and exit of my soul, it extended my existence. Inside the rutilated quartz there was this metaphysical world, in which there were materials. What is empty is no longer empty, the clouds float in light and colors… – that denotes a state of mind, as well as a state of life. T.B.N: What do you enjoy most about your career? What advice would you give to aspiring designers and business owners? W.C: Accessories have existed in human history for a long, long time. It appeared way earlier than other forms of art. It is an ancient culture, and this culture has then become evidence of civilization, and an embodiment of knowledge aesthetics, wisdom and emotions. And my greatest enjoyment is to express emotions, wisdom of our ancestors and the greatness of Mother Nature through jewelry creation. Jewelry stands for eternity, and through this eternal media I can share the stories and meanings of life with others. Designer and creator are different, and they are different from merchant or dealer. Very often, designers come up with ideas and sketches, and then they hand over their ideas and sketches to craftsmen to work on. However, I encourage designers who are interested in the jewelry field to learn with patience, and to train up their ability to reach out to all directions – on the top there is culture, philosophy and art, beneath these there is knowledge of a craftsman that includes optics, physics, ergonomics, metallurgy etc., on the left you find technology, and on the right there are trends and markets… The mastery of all allows greater creative freedom. I am not very good at commercial activities, certainly not an expert in business. But I believe that as a merchant, dealer or investor of this field, it is important to acquire thorough knowledge of the field in order to recognize the talents of a creator. Designers and creators live in their own worlds, their pursuits tend to be more spiritual, but merchants live in a collective world, and economic growth is their fundamental consideration. But the former and the latter join hands to create the many legends we have seen in this industry. T.B.N: Your pieces are considered to be works of art in their own right, and I would certainly agree that they are extraordinarily beautiful yet delicate and complex. Was that always the goal when you were designing your first pieces? 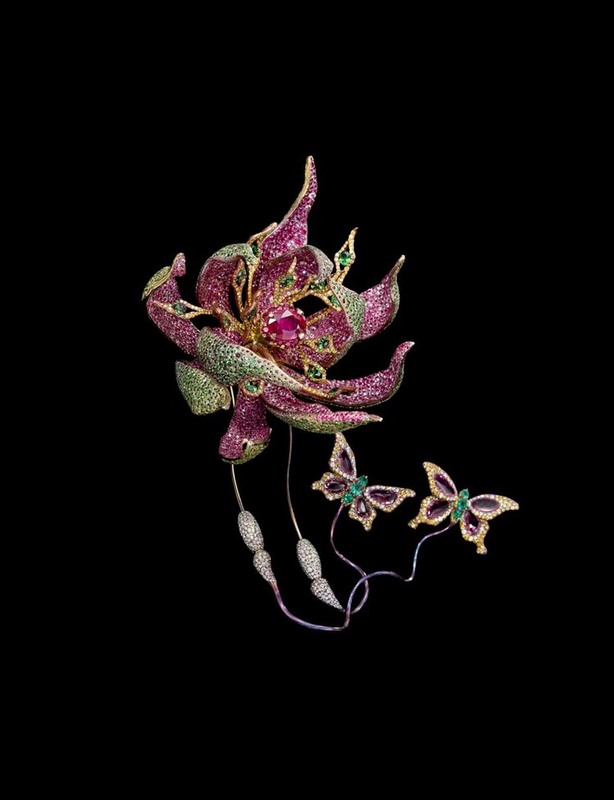 Wallace Chan “Fleur de la Dynastie Tang” brooch with rubies, yellow diamonds, pink sapphires, tsavorites, garnets, emeralds and diamonds. Featuring the world’s largest flawless purple sapphire weighing 164.39ct this is the “Gabriella Rose” necklace symbolizing femininity, harmony and tranquility. W.C: If I must define the goal of my creation, it is the true, the good and the beautiful. When I feel that my creations are far from meeting the standard, that is when I have to destroy them and start over, or I may put them aside for a period of time, and try to enhance and enliven the knowledge on my mind. My creations come alive when I enter a new world of thinking. I have this very strong belief in my life: only when I have my work done to perfection today can my dreams be realized tomorrow. I maintain the same attitude towards any goals, dreams, obstacles and challenges in my life. It is fair to say that, in life, we may not always be rewarded for our hard work, but it is always true that no pain, no gain. The aesthetics and craftsmanship of each piece of creation is nothing but the result of hard work. T.B.N: Lastly, what is the ultimate vision for yourself and your brand? How would you like to be remembered as a designer? W.C: I enjoy living for the moment, spending every second and every minute on creation. History is vast, and deep, the universe is wide, and limitless, and our existence is so small. I look at the world with the curious eyes of a child. I have to seize the moment, practice on and do my homework. Once I have completed a piece of work, I must move on to something new right away, as I cannot linger in the satisfaction that belongs only to the past. I hope that with my creations I can fulfill my responsibility for history, and I leave it to history to grade my performance. It was great honor to be given the chance to interview Mr Chan. His passion, seemingly endless creativity and respect for his art only fuels my own career goals. He is, in my eyes the true definition of the word “Craftsman” using his various skills and experience to create one of kind, sublimely beautiful and timeless works of art. Special thanks to the Atelier of Mr Wallace Chan. 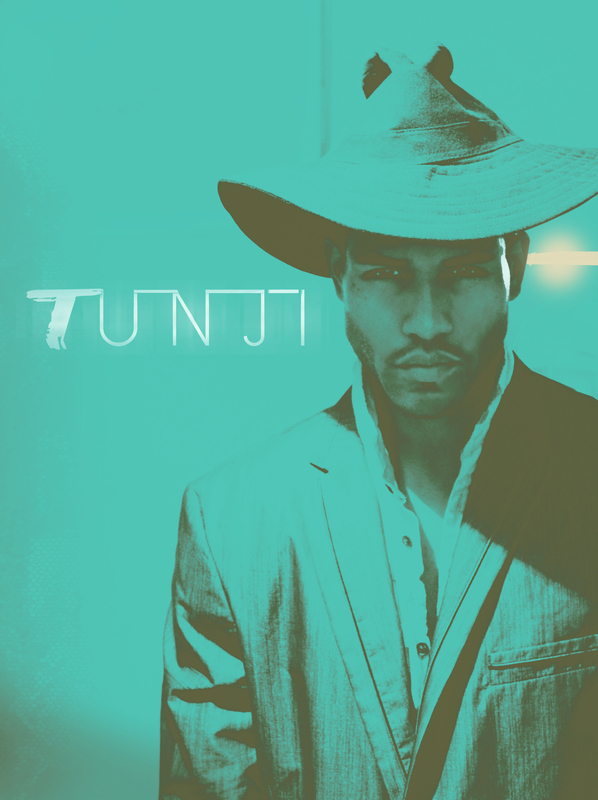 Today I am please to welcome singer/songwriter Tunji Alade III to The Black Nouveau. 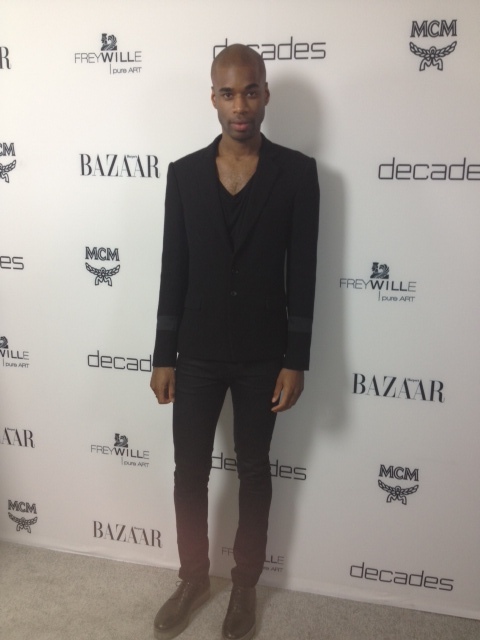 We discuss his love of music, fashion, song writing and his plan to become the next great musical artist. T.B.N– Welcome Tunji and thank you for taking the time to talk with me!Lets begin with your background, where are you from? T.A– I am from Houston, Texas. My family is from Lagos, Nigeria, London and Guanajuato, Mexico. I also have family in Virginia and New York City. T.B.N– Your music is a wonderful mix of sounds and you have a very captivating voice. Was music something that always aroused interest in you? How would you describe your music style? T.A– Music has always been my first love. I’ve always been attracted to it and it has always been part of my desire, music makes me feel and inspires me. I won my first contest at age seven in a classical music competition. I was a runner-up and won a contest to visit this amusement park called Fame City. I would describe my musical style as smooth, vibrant, fresh, bold and even raw. I’d say my music ranges from Hip Hop to smooth Rhythm and Blues, Soul, EDM, Acid Jazz and Jungle and House mixes. My music emanates from experiences, breakups to relationships, love and vice versa. I describe my music as a style that is…married to fashion, art and the club lounge experience. T.B.N– How long have you been singing? Also you write your own music, what sort of challenges do you face when creating a new song? T.A– I’ve been singing since I was thirteen and writing since I was seventeen. Thinking of a new song is like an idea, I can come up with hundreds of ideas just from the instrumental. People don’t want me to think of a new song, they want to see my live performance; they want to be able to connect with me and get to know me. T.B.N– Share with us a little about your new album. What was the inspiration behind it? T.A– My album so far has eight songs. My EP with six songs was just leased through INgrooves Music, the back office of Universal Music Group. 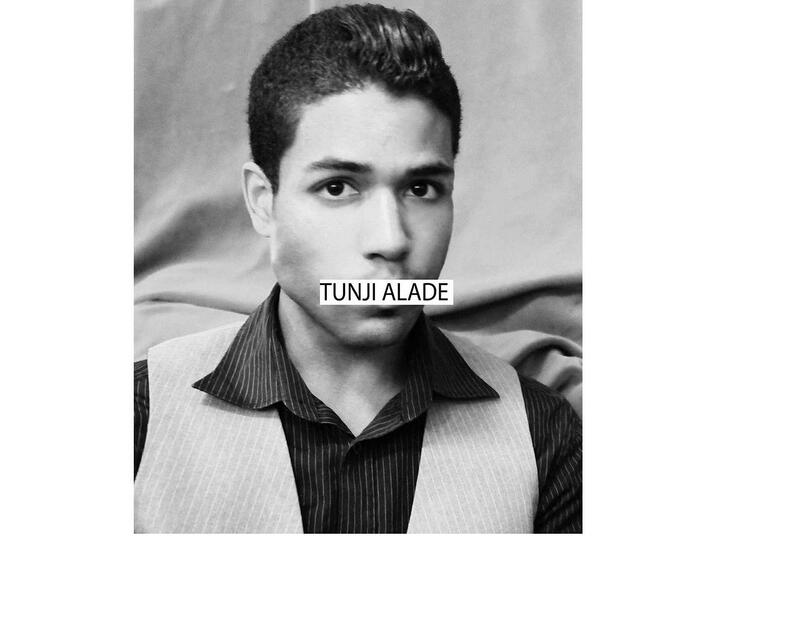 My name is Tunji Alade, and my full name is Tunji Jemi-Alade III. Tungsten Light is sort of an anagram of my name, Tunji Alade. Essentially the tungsten light hue is only visible naturally at magic hour. The inspiration behind my album is to find hints and clues. Fate, paths, and destiny interconnected with people through the human experience and through music. T.B.N– How do you see yourself and your music evolving within the next few years? What are your long term goals? T.A- I see myself evolving greatly. They say it is not where you’ve been but where you’re going. Right now, I’m affiliated with a company called Hotbox. Ironically, I see myself with a team that will tell me who that is. I’m not even being sarcastic. Seriously, I hired a manager not long ago and we almost signed a major deal and it sort of fell flat because attorneys from Warner Brothers called my managers office back and said that I am/was with attorney/client privileges. This was not too long ago and when I contacted Warner Brothers Music, no one knew who I was. It was kind of strange submitting my demo and getting calls back from Interscope, Sony then getting word from a manager that I hired saying that Warner Brothers contacted him and told his management office that I am with attorney/client. Having no documents signed, no official contract, no statements that told me it was official, nothing in writing to let me know what was going on was strange. Even in retrospect for me to think of where I want to be its very clear because I was affiliated with a major studio in 2000. In 2002, my junior year in college, my university pulled me aside and told me that they had officially gotten word that my undergraduate work was created into a music video and was broadcast on national television. Then all of a sudden in 2002, I had a million dollar offer for a property and a random phone call from a broker that told me she handled all my paperwork. Right when I was going to buy a 1.1 million dollar mansion, coincidentally, my off campus apartment flooded as a sick building with a sanitation problem of a flooding toilet; it became difficult and my university would not tell me what company contacted them to verify what company I was working for. Being an underground artist or ghost writer, I see myself evolving with the right team. I want to formalize my contracts with the right team. I know about business, about knock-offs and the intricacies of trends, being a hot artist or an artist that has the new hairstyle, new digs, new style. And how to strive to for a level above that into a longevity hallmark level. Signing with the right major and formalizing the right deal in the right way so that there is no confusion if it is realistic and that it is literally legitimate. For me, my expectation is to move forward with a team that will give me full creative control and options to work with artists that I respect. I am not trying to be any artist except me. My music is my voice. My music is married to fashion. I see my shows as being part high energy choreography and part runway show. My followers are affluent heads, people who love fashion, art and commerce. In the next few years, I see my album already published and licensed while working on a second and third follow-up album, acting in feature films and doing business with the most advanced marketing endorsers. I see myself immersed in the business and doing what I love. T.B.N– Finally, what advice would you give to aspiring singer/songwriters? Was there anyone that you admired growing up that inspired your interest in music, and how? T.A– I was scouted by a major agency and won a modeling competition at age seventeen in High School and was not allowed to follow my path. I also was not allowed to play a musical instrument growing up. It can be very brutal, move masterfully, don’t let others who don’t care about your goals determine your rate of success. Make it happen. When I was growing up I admired all kinds of music. I especially loved music in different languages from foreign countries. Then around 2006, music really started speaking to me in a special way, I started to really command on the Piano with a handful of songs I composed. Then, Tunechi came out and my friends started asking me if I could sing. I love music from Coltrane to Davis to Portishead to Massive Attack to Green Day, Niyaz, Maxwell, Timberlake, Timbaland, Alicia Keys, Jay Z and Beyonce. Any Grammy award winning artist or any artist under Berry Gordy or his understudy, Etcetera. I would like to sincerely thank my good friend Tunji for this interview. Please visit Tunji below and take a listen of his truly unique and original sound. Hey guys, I recently conducted an interview and styled a feature with one of my good pals and up and coming musical artist, Tracee Owo. She is a true creative talent who has impressed me with her intellect, love of music and art and of course her personal style. Check out the full interview below. 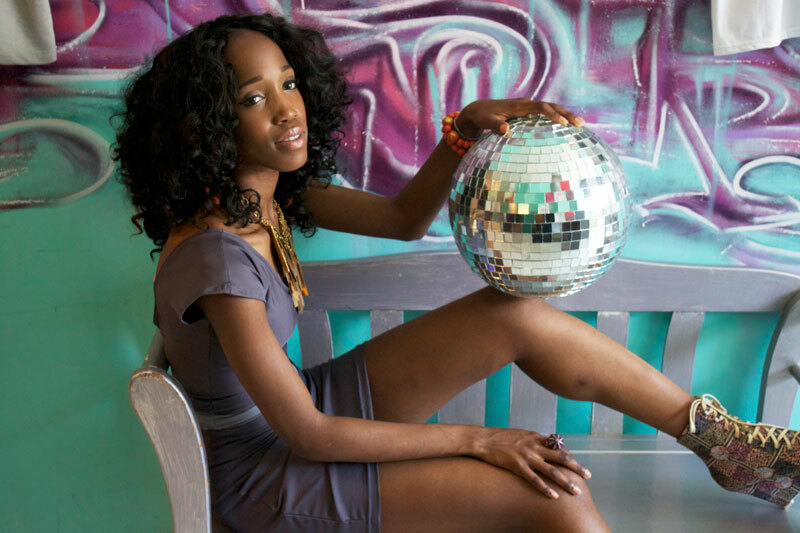 T.B.N: Thank you Tracee for being our very first featured artist for Live Astro New York! Please introduce yourself for everyone – where are you from and where do you currently live? Tracee: Thank you guys for the feature! To put it simply I’m a creative mind. My creativity includes being a vocalist, songwriter, musician, and more. I feel like creativity has no boundaries. I’m also the daughter of hard-working Nigerian parents who are my biggest inspiration. I’m originally from Prince George’s County outside of D.C. but now reside in Brooklyn, NY. T.B.N: I’ve had the pleasure of knowing you for some time now and I know that you are a very goal-oriented person, what is the most important goal you wish to reach this year? Tracee: The most important goal for me this year is to reach and make an impact on more people through my music, one person at a time. Only good can come from that! T.B.N: You’re working on your first EP. Tell us a little more about it and what your process is for creating your music. I’m working of my first full EP project titled “Upon a Time”! It’s a compilation of songs that each tell us a different story. Stories of determination, love, pain, and redemption. Not all of the stories are a reflection of me or my personal life but they are reflections of people and images we all see in our lives. When I create it never feels like a process. For me, its more like a “happening.” Waiting for and allowing the right moment to happen and in turn creating something beautiful.. Dress by Polychromatico!. Necklace by Anu Jewelry. T.B.N: What do you find to be the most difficult and the most simple in the way that you work? Tracee: It’s funny because I don’t find this to be difficult but a lot of the people I work with, whether it be producers, engineers, graphic designers, etc. have all said the same thing: “You’re very particular, direct, and want things to be perfect… but I like that” Although they say they like it, I know it gets on their nerves sometimes. That’s why I appreciate all of them so much. It can be difficult to be that way at times because it may take a bit longer to get things done..but when it’s right, it’s right. Oddly enough, the most simple part in the way I work is actually recording. I like to over-prepare but it works. T.B.N: What are some of your favorite artists, and who’s on your ipod currently? Tracee: The infamous question that I can never fully answer! I love a range of artists for different reasons, from Blossom Dearie (jazz singer) to MJ to Chaka Khan to Queen to Kanye. Just like my taste buds love different kinds of food, I love different types of music and artists. I think every music enthusiast struggles with this question – Let’s abolish it! T.B.N: Your latest single is “Footsteps”. What was the most exciting part about creating it? How may people discover more of your work? That song is deep on so many levels for me. It actually took the longest to create because I wanted it to be right and evoke the right emotion. The most exciting part about creating it was shooting the music video visuals with Julian Antetomaso (Videographer) and LaShaia Artis (Fashion Designer/Photographer). We shot all in one day, guerrilla style, at three locations, one being a beach in early September and it was a bit chilly outside that day. But our energy and commitment was amazing and it shows in our final product. I’m working on the release another music video for a single off of my EP scheduled to be released this summer which I am UBER excited for! You can watch the current video for “FootSteps” and download the single now via www.TraceeOwo.com. Thank you guys for the feature and thanks to everyone who supports the vision! Thank you so much to Matt and Tracee for the time and please check out more of Tracee and her craft. Please visit www.Liveastrony.com to shop all of the looks shown here. Hello world! I want to show you something that is very special to me and will hopefully be special to you as well. This is the introduction video to my youtube series with Sergio Wonder of RunwayWonderland. It is our 1st series of many and I hope you all will be down for the ride! Without further ado, The Black Nouveau is proud to present….Sergio + James Series 1. This is a profile done about me by Matt Fox over at Fineanddandyshop.com I was so honored to have this done…I’m normally on the other end doing the interviews on other people. So here it is…enjoy! Thanks so much Matt for doing a post on me! Over the past several months we have been introduced to many amazing people in the virtual word of blogs and social networking. With this post we continue a regular series of profiles of New School Dandies. 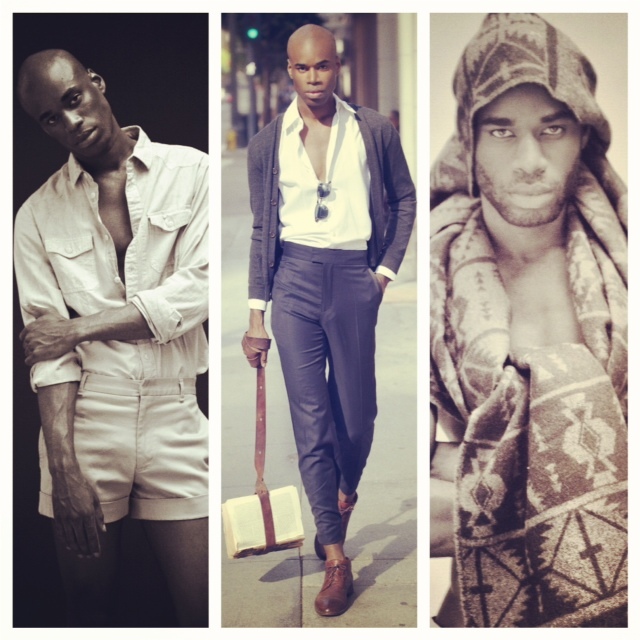 This week we feature James Field of The Black Nouveau. Where did you grow up? Stroudsburg, Pennsylvania, the area known to many as the Poconos, but it’s truly my favorite place to be. I miss it a lot. Where do you live now? Jersey City, New Jersey, only here for school, it’s closer to New York without actually living in New York. What’s your occupation? I am a full-time student, but I work part-time at Henri Bendel 5th Avenue. I also created and run my own fashion blog…(which seems to take up more time that work and school) called The Black Nouveau. When did you establish your personal style? Was there a pivotal moment? How has it changed? I established my style the moment I realized I would be going to college in New York City. Living in P.A it was mostly jeans, button shirts and sneakers, but when I began to watch fashion shows and read GQ religiously before school ended…I became a new person in a way. But the pivotal moment that sealed my new personal style was when I worked as the Assistant to Derrick & Kirk Miller, the creative design team of Barker Black shoes. They introduced me to suits, wearing wingtips, pocket squares and bow ties. Kirk actually helped launch the Thom Browne line so he wore a lot of Thom Browne suits to work and they were always well tailored and fitted, and after working there for almost a year their style rubbed off on me. I began buying cheap thrift store suits and tailoring them and wearing wingtips with no sock in the summer and getting all my dress pants hemmed above the ankle. Working with those guys really showed me a new style of dressing that I was always interested in, but was to afraid to try. How would you describe your style? 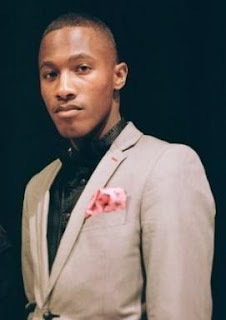 Classic meets youthful and fresh, since I have dark skin bold color shirts pop off well on me, and I’m tall so slender pants and blazers are like my best friends. What are your sources of inspiration? 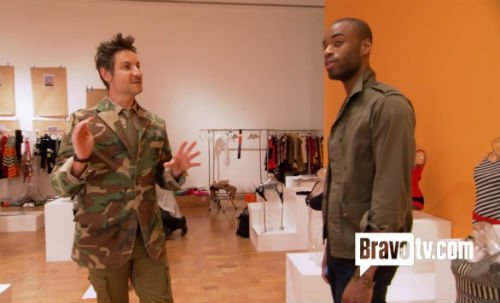 Thom Browne, Michael Bastian, Robert Geller and this may sounds funny but …Steve Urkel. I just sooo wanted one of those Collegiate cardigans he would wear with the stripe on the arm! Who is your style icon? Derrick Miller of Barker Black. What are your preferred dandy reading materials? GQ Magazine. What is your favorite personal item (non-clothing/accessories)? My Burts Bee’s lip balm. What is your favorite clothing article or accessory? A double breasted, camel trench coat that I found at a vintage shop for $30. It fits like a charm and I didn’t have to tailor it or anything! Where is your favorite or dream vacation spot? I’ve been to Alexandria, Egypt. That was my favorite vacation spot. I would love to move there one day. Tell us the best kept secret in your city. “Yoga To The People” on Saint Marks Place is free yoga, it may not be a best kept secret but I sure think so! I love it. At which establishments would you consider yourself a regular? Housing Works Thrift Shop in Gramercy Park. What is your current obsession? Argyle socks! Currently inspired by? All things British-Made. What would you be doing ten years from now? I will have evolved my blog into an online magazine with a vintage clothing section featuring pieces that I ship in from all around the world. I will also have an art gallery / café style, type space somewhere in the West Village. The passion, drive and tenacity of young talent is truly inspirational. I love to meet young musicians, designer and artist who have a true identity and are working hard to accomplish their dreams. The Black Nouveau interviews David Jon Acosta of GoldSaturn.com on his cool designs, being a Miami native and the goals of this new young talent. T.B.N: So David, what inspired you to create Gold Saturn? T.B.N: Your Tee designs are so whimsical and fun, what was your favorite creation and why? David: My favorite creation is… it’s so hard! It’s like asking a mother to choose her favorite child. The “Prescription for Peace” is definitely my claim to fame. T.B.N: You’re based out of Miami, America’s sexiest city, what is the Gold Saturn customer like? David: The Gold Saturn customer is the kind of girl or guy that you see across the room and you want to get to know. My T-shirts are definitely conversation starters, and they are not for the wall flower. T.B.N: What do you love about fashion? David: I love the art of it. I love graphic designs and I love fashion even more, so I think that Gold Saturn is the perfect mesh of the two worlds that I adore. T.B.N: Are you originally from Miami? David: I was born in New Jersey and moved here when I was very young. I love Jersey but its like R&B music, I like it but I don’t want to be around it. T.B.N: At only 24 years old, you have such a head start on becoming a successful designer, what are some of your goals in the near future? David: I am not easily satisfied. I want my T-shirt’s on the cover a magazine. I want Gold Saturn to be available at Barneys. And I want an Olsen twin in one of my T-shirts. Until then I’m completely unsatisfied. T.B.N: Do you see more items such as pants, jackets, dresses etc, evolving from your Gold Saturn label? David: Yes definitely. I just started doing dresses. I’ve always done headpieces. I would love to branch out and do tote bags, beach towels, rompers, jumpsuits, hoodies, and little pouches to store your marijuana. I know what kids my age need. T.B.N: Finally, what do you hope to accomplish with your Gold Star brand? The Black Nouveau sincerely thanks David Jon Acosta for his time.